There are certain occasions when fine dining is a must. While not all first dates will be worthy of the fine dining experience, when you have a special first date, it can be a wonderful option. 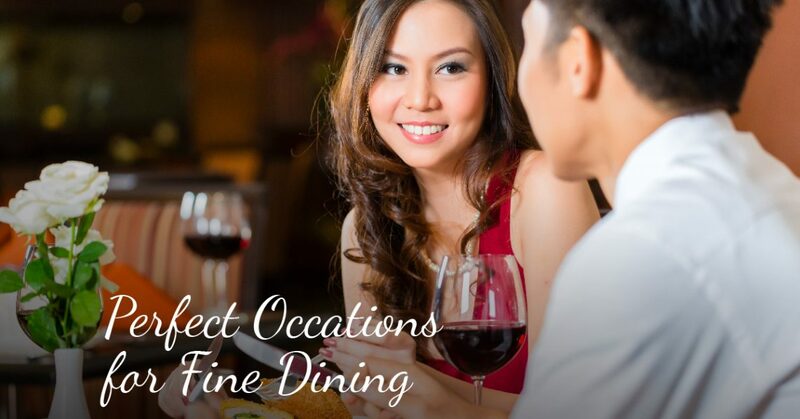 Whether you’ve been pining after a special someone for years or you instantly connected when you met them, when you have a special first date, you want to make a great first impression, and there’s no better way to do that than by taking him or her to a fine dining restaurant. Have you recently been promoted or landed your dream job? Don’t slum it at cookie-cutter, chain restaurant that serves mediocre food and has lazy servers. Instead, celebrate your career move at a place that you can be proud to tag yourself at on Facebook. After all, Steve Jobs would never have eaten at a chain and neither should you. Are you about to say, ‘I do,’ to the one you love? Your wedding is arguably the biggest event in your life, but don’t overlook the rehearsal dinner. Not only is the rehearsal dinner a chance to tell your friends and family how thankful you are for their support, it’s also an excuse to spend some quality time with them before the big day. Choosing an elegant restaurant will help to set the stage for your wedding and get everyone in the mood to celebrate. Graduating is a big deal, whether it be from high school, college or a master’s program. You’ve worked hard to get to graduation day, and now that it is finally here, it’s time to celebrate in style. What better way to celebrate and compensate yourself for all of that hard work than by biting into our perfectly cooked rib eye steaks or our famous Surf & Turf? Retirement is like graduation but better. If you are like most people facing retirement, you have probably worked most of your life and you are finally about to experience some much-deserved free time. You’ve probably been waiting 40 years or more to get to this moment, do you really want to savor it with an overcooked hamburger from a chain restaurant? Instead, celebrate your retirement with the best fine dining restaurant in all of Rapid City! When you ask someone to marry you, the last thing that you want is to be surrounded by a noisy crowd, sassy, grim-faced servers, and boring, generic food. You want to go to a restaurant that helps to set the stage for this magical moment, and a fine dining restaurant is the perfect place to do so. Although the occasions we listed above are all great excuses to visit our fine dining restaurant in Rapid City, here at Stonewalls Kitchen, we don’t think you need an excuse to experience our great food, out-of-this-world service and one-of-a-kind atmosphere. Once you try Stonewalls, you’ll never want to settle for less than the best again! Make your reservation with us online today!